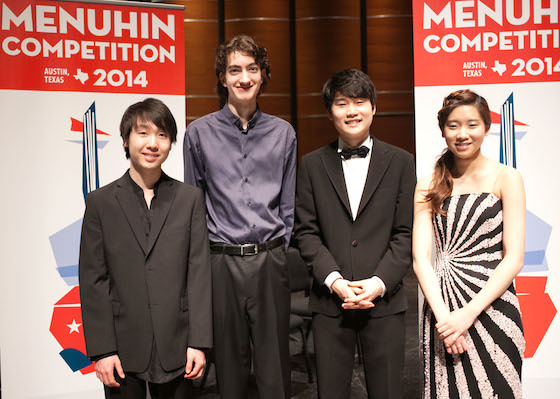 AUSTIN, Texas — The Senior Division laureates for the Menuhin Competition were announced Saturday night, after a concert in which all four finalists performed with the Austin Symphony to a sold-out crowd of more than 2,000 at the Long Center for the Performing Arts in Austin. "If (Yehudi Menuhin) were here tonight, he would be absolutely thrilled as to what happened to this competition," said competition Artistic Director Gordon Back. "Tonight you have witnessed some of the best playing you'll hear in any competition, in any city, of any age." Announcing the winners, jury chairman Pamela Frank said, "I would like to thank these young players. Tonight was a culmination not only of a celebration of the violin, but also a celebration of music in general. Tonight, this was one of the greatest concerts I've ever heard, period. We have four fantastic artists in our midst, and we will hear more from them. The big winner is the music world, to have you all in it."